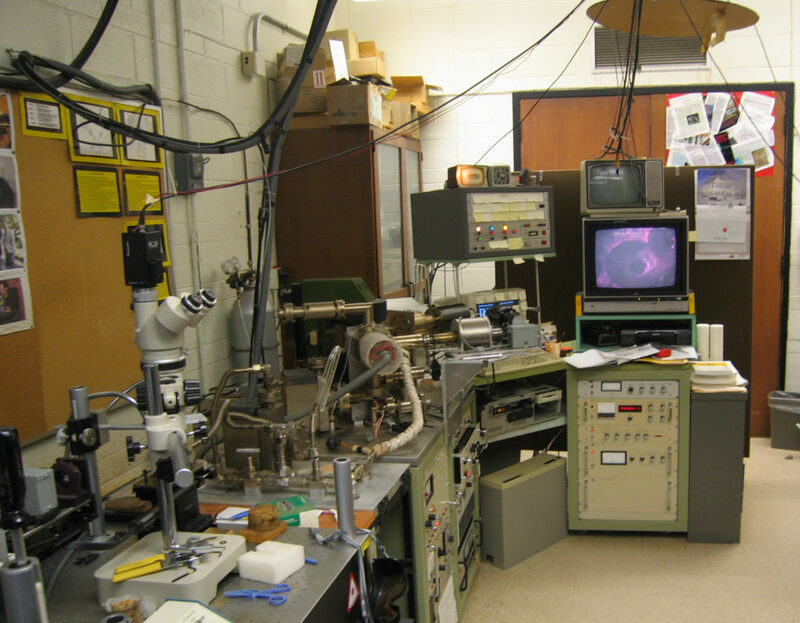 This is a large control console from the laser-heated rare gas mass spectrometer. It is composed of two primary units. The larger, lower unit is a large rectangular grey metal box. The grey-painted metal box frames the front surface which is composed mainly of plastic buttons and lights mounted on aluminum backing plates. 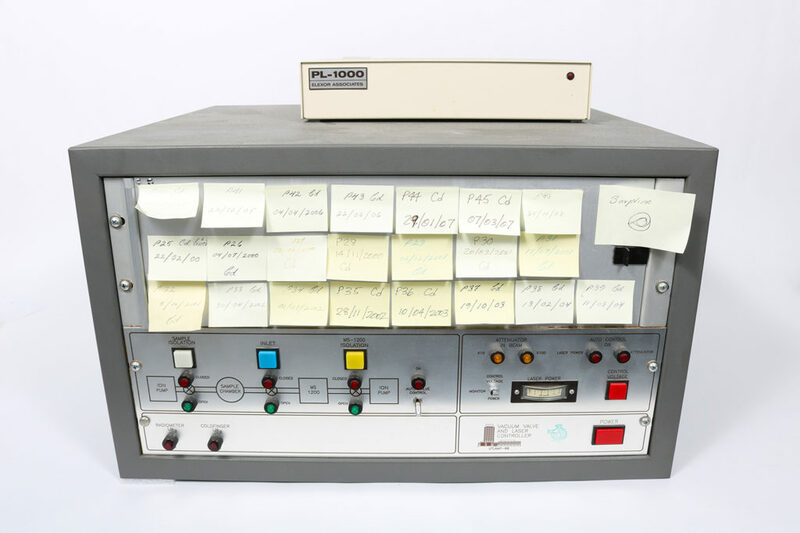 Twenty-two smaller yellow stick notes, marked with pen, are attached to the upper part of the front of the console. One larger stick note indicates the location of the switch activating the sorption pump. The back surface of this lower box contains a variety of connector ports, all of which are labelled. A smaller upper box consists of a white coloured metal case with a single name plate and a single red LED indicator. 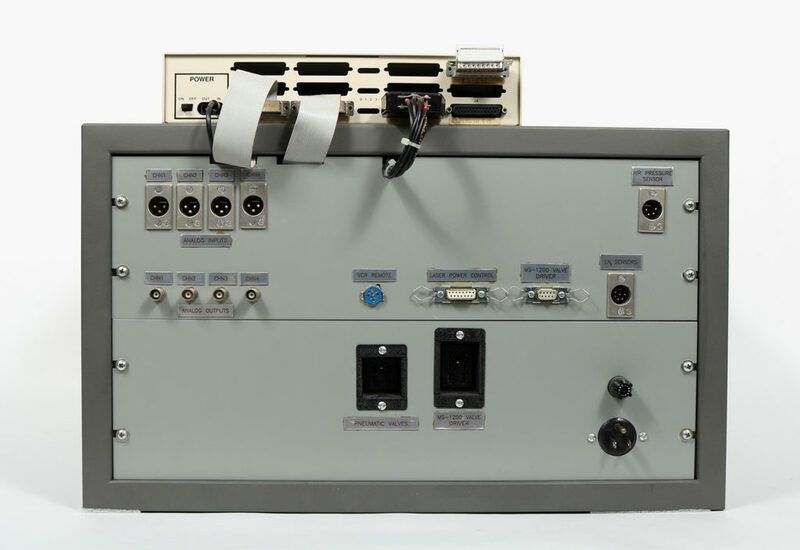 The back of this box is connected to the back of the lower box with three integral connectors. Vacuum Valve and Laser Controller for Ar-Ar apparatus. Primary Materials: Metal: Steel and Aluminum. Lower console: A silk screened maker’s mark from the University of Toronto Department of Physics machine shop, features an image of the McLennan Physical Laboratories building. It reads “Vacuum Valve and Laser Controller UTLAMP-88.” Beside this mark there is an image of a turkey made with an inked rubber stamp. Nineteen stick notes, marked with dark pen, provides an internal irradiation number (in this case a “P” followed by two digits), which is, in most cases, followed by a “Cd”, indicating the use of a cadmium liner. A further, larger stick note reads “Sorption”, accompanied by a small pen drawing. 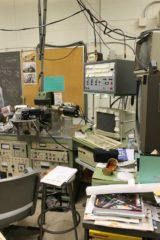 This control console that was used with a Laser-Heated Rare Gas Mass Spectrometer for Argon-Argon (Ar-Ar) dating. Very Good: Some minor corrosion around bolts and metal plates and a detached label. Otherwise, in very good condition. This artifact was collected on Friday, July 24th 2015 from the Potassium-Argon dating laboratory that was founded by Professor Derek York (1936-2007). The console was part of the laser-heated rare gas mass spectrometer, an instrument that York played a key role in developing..